There’s a growing and, frankly, disturbing trend on YouTube wherein people create and upload videos clearly geared towards children, but filled with violent and inappropriate content. How inappropriate? Come, walk with us and be dismayed. The issue recently came to our attention when a friend with small children mentioned that he was increasingly finding very weird videos, on both the general YouTube site and on the YouTube Kids app, while searching for kid-friendly content. What kind of weird? Dozens and dozens of videos that looked otherwise kid-friendly but with popular characters acting violent, getting hurt, or engaging in inappropriate behavior no parent would want their child to emulate. We’ll admit, we were positive it had to be some sort of odd or isolated case. Of course there’s content on YouTube that isn’t kid friendly but videos co-opting popular characters to show kids violent and weird stuff? At first blush it sounds kind of like a razor-blades-in-the-candy story, right? But, sure enough, when we fired up YouTube (both the regular site and the YouTube Kids app) and started searching for popular characters, within the first few search results there were plenty of bizarre examples of these videos. 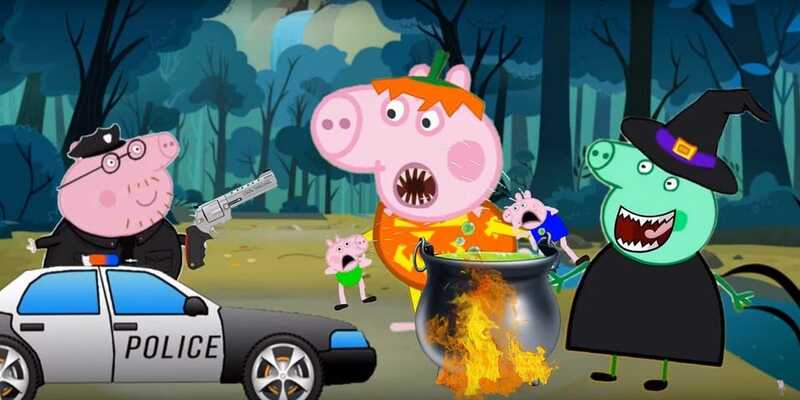 Here’s an example we found on YouTube that shows characters from Peppa Pig (or close approximations there of) as monsters that steal children, throw them in a pot to cook them alive, and get shot in the head by the police. Yes, that’s an animated Peppa Pig-style cop holding a revolver. We’re pretty sure the cops shooting people in the face is not part of the Peppa Pig cannon. You know that picture of Mickey Mouse dressed up like an old-fashioned robber that we opened this article with? That’s a screenshot from a video we found in the top search results after searching for “Mickey Mouse” in the YouTube Kids app. The 10 minute long video opens with two children (that look like baby Mickey and Minnie Mouse) playing in a park. The “robber” Mickey comes over and offers Minnie candy, which she accepts. She licks the candy, it drugs her, renders her unconscious, and the “robber” Mickey abducts her. That same video also includes the same small baby Mickey that appears in the original segment spanking his teacher with a ruler, seen below, when she reprimands him for getting 3+3 wrong on the chalkboard. Later in the segment we see Mickey beat up his sister, get screamed at by his mom and spanked, and an older Mickey and Minnie Mouse type pair drinking alcohol, only to have Minnie burst into tears when the camera pans and reveals she’s pregnant. Truly, you can’t make this stuff up. These two videos are hardly isolated incidents, either. During our travels we came across examples of Peppa Pig knock offs stealing cars, Mickey Mouse knocks offs threatening each other with guns, characters “pranking” each other by urinating on each other (you haven’t lived until you’ve seen a poorly animated Elsa trick Kristoff into peeing on Anna), and an absurdly high number of videos that showed people in positions of authority misbehaving (like policemen beating kids and doctors yanking on children and feeding them syringes). You know the helpful Mickey Mouse from Mickey Mouse Clubhouse who helps everyone in need and says “Awww, shucks!” a lot? Well you won’t find him in the videos we kept turning up, like the one, seen below, where Mickey lures Minnie into a graveyard only for her to be attacked by zombies and left screaming in terror in a puddle of her own urine. Again, seriously, you can’t make this stuff up. This is not the Disney Channel content we remember, that’s for sure. Even when these character rip-off videos weren’t shocking, they were still packed with the kind of content most people wouldn’t want their young children watching like showing siblings knocking each other down and getting rewarded with candy or stealing from each other with no repercussions. What’s particularly puzzling about it all is why make them in the first place. Clearly the policing of intellectual property is lax and they can already get away with ripping off major brands targeted at children (like Peppa Pig and Mickey Mouse) but why inject the violence? These are videos purposely designed to look indistinguishable from legitimate content but, for no readily apparent reason other than to expose children to it, laced with inappropriate content. Further, the audio tracks for the videos are often cheerful and sound just like regular kid-friendly content—so unless a nearby adult is looking right at the screen they’d never realize their kid was watching a witch boil some children alive—which makes it all seem even more malicious in nature. We work to make the videos in YouTube Kids as family-friendly as possible and take feedback very seriously. We appreciate people drawing problematic content to our attention, and make it easy for anyone to flag a video. Flagged videos are manually reviewed 24/7 and any videos that don’t belong in the app are removed within hours. We will continue to work to improve our systems to make the YouTube Kids experience better for everyone. Additionally, they noted that all the videos we submitted to them as examples of the offensive content on YouTube Kids had been reviewed and removed (and they were, in fact, gone when we tried to find them again in the YouTube Kids app). While we’re glad that they’re working on improving things and removed the videos we flagged as inappropriate, that still leaves parents in an awkward position as the offending videos are removed after the fact. At this point, you’re probably pretty uncomfortable thinking about the idea of your preschooler watching videos, right under your nose, of kids being eaten by zombies, firing guns at each other, or getting abducted—and who could blame you? Right now you simply can’t rely on YouTube Kids to provide a completely kid-safe environment. In fairness to them, they even say as much in the setup process for the app, indicating that the videos are algorithmically selected and not hand curated. 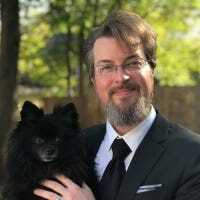 When we reviewed the YouTube Kids app at How-To Geek, we even noted that the algorithm was kind of wonky (searching for “corn” would give you boring videos from Cornell University) but there wasn’t originally an issue with this kind of content. The real problem is that scummy people figured out how to game the filter and keyword algorithms to put these weird videos in front of kid (see the highlighted title of the example video below). In fact the algorithm might even be making it worse. The automated system does a pretty job filtering out the obviously inappropriate stuff (like, say, wet t-shirt contest videos and horror movie trailers) but it does an absolutely awful job at filtering out stuff that looks kid-friendly. 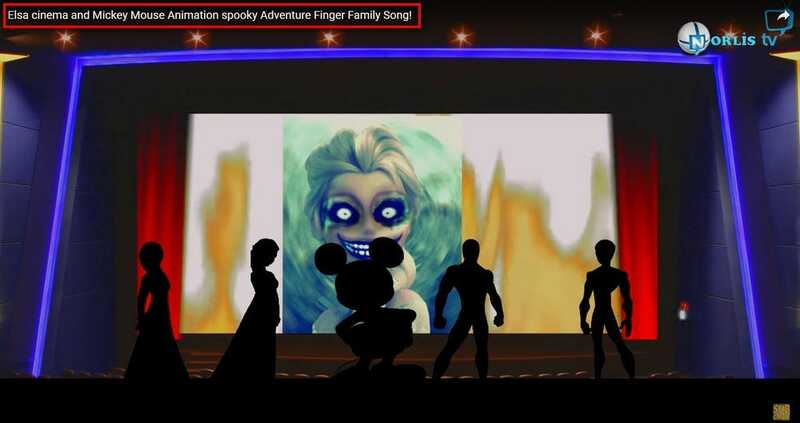 Unless parents find it and report it, it just gets shuffled in with the rest of the stuff tagged with keywords like “Mickey Mouse”, “finger family sing along”, or whatever terms are linked to popular children’s content. With that in mind, until something major changes in the design of the YouTube Kids app and the algorithm, you can’t trust that your kids won’t see inappropriate content. And if YouTube Kids is out the window, then the YouTube itself is absolutely out the window for young and unsupervised kids too. It leaves you relying on video sources that are closed, manually curated, and don’t have user-uploaded content. Here’s how you can get away from relying on YouTube content and get some properly curated content in front of your kids. On the free side of things, PBS has a wonderful kid’s application available for tons of platforms including iOS and Android as well as for the Kindle and Nook tablets. All the content is direct from the PBS kids catalog so if your little one is watching Daniel Tiger’s Neighborhood in the PBS app you can be sure it’s the real deal and not some knockoff where Daniel steals a school bus to recreate scenes from Grand Theft Auto. In addition to the shows your kid loves, there’s also educational and fun apps based off the characters from those shows. Yay, Public Broadcasting Service! If you have Android tablet, be it a generic table, an Amazon Fire tablet, or their Fire Kids Edition tablet, you can install the Amazon FreeTime app and, for a few bucks a month ($3 for Prime subscribers, $5 otherwise), get access to thousands of age-appropriate books, movies, TV shows, educational apps, and games on your tablet, phone, Kindle, and FireTV. The content on FreeTime is strictly controlled, the parental filters are well implemented, and the curation is done by using human-reviewed media lists, parent input, and other human-driven methods that ensure the content is vetted for. You’ll find content from Disney, PBS, Nickelodeon, Amazon Kids Originals, and more. Better yet, if you buy a new Fire Kids Edition tablet ($80) you get a free year of FreeTime Unlimited, a super durable bumper case to protect the tablet, and a two year no-questions-asked warranty where Amazon will replace the tablet if your kid decides to use it as a monster truck landing pad or drop it off your deck into the pool. If you’re already planning on paying for FreeTime Unlimited, it makes no sense not to buy the tablet. If you’re using an old tablet for your kids it pays off to take the time to configure it to maximize the kid-friendly factor by both restricting them to only the apps you want (like the aforementioned PBS Kids app) and keep them out of the apps they don’t belong in (like the settings and the web browser. Over at How-To Geek there are some great tutorials to help guide you through tweaking your old iPad or Android tablet into a kid-friendly video and game machine. Whether you skip YouTube altogether and put a coloring book in their hands or lock them down into an application like PBS Kids or FreeTime, the real take away here is that YouTube is a very, very, weird place for children and until serious filtering and algorithms are implemented you shouldn’t let young kids anywhere near it.